Home - Social Media Marketing - Facebook’s Algorithm, Deconstructed. Unhappy with your level of engagement on Facebook? Do you feel like your posts are not being found by the right users? Algorithms like Google’s monstrous equation or in this case, Facebook’s, are created for the sole purpose of solving a problem. 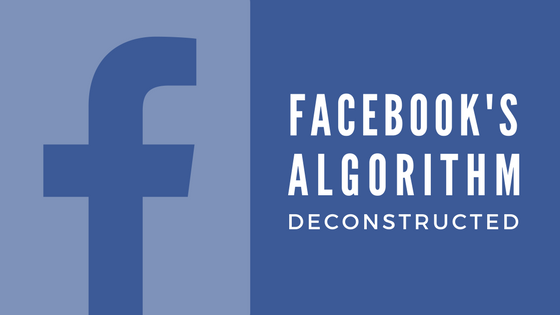 Today we’re going to tackle the complex algorithm of Facebook in 4 simple steps. Shout out to The Social Media Examiner for inspiring this post! So, what is the problem that Facebook is trying to solve? Let’s get to the nitty-gritty! Like we mentioned above, this complex algorithm can be broken down into 4 steps. These are inventory, signals, predictions, and score. Inventory: First, Facebook’s algorithm looks at the available content given by each of the users communities they’re already connected with (business pages and personal pages alike). Predictions: Facebook’s algorithm essentially is a prediction algorithm. It uses the above signals to calculate the probability of certain outcomes, like how likely it is based on your previous Facebook engagement that you’ll like or comment on a particular post. Score: After making these predictions and calculating the probabilities, Facebook consolidates the information into a relevance score, a number that represents how interested Facebook thinks you may be in a certain story. It also predicts whether you’ll click, comment, share, hide it, or even mark it as spam. It will predict each of these outcomes, and then combine them all to produce a single relevancy score specific to both you and that post. So, how do you make sure your Facebook content is optimized? Create posts that are likely to result in people clicking on your links, photos, copy, videos, and other content. Each of our dealers are unique and therefore your audience is unique as well. You know better than anyone what they’re interested in as it relates to your business but you might not always know what is most relevant on social media. For example, with the debut of a new industry leading product, linking a video of the product demo might gain more traction online than simply citing an article or writing your own content about the new product. For more help generating social content, reach out to us in the comments below, we’d love to hear from you!